A previous article, 5 Pillars of Cold Chain Packaging, discussed the five key principles of cold chain packaging and the importance of selecting a supplier that has specific experience with all the components of cold chain packaging in order to develop a successful customized packaging program that is both reliable and cost effective. As such, it’s important to take a holistic approach to optimizing cold chain packaging to ensure each component within the package is optimized and in accordance with each perishable product’s unique needs. 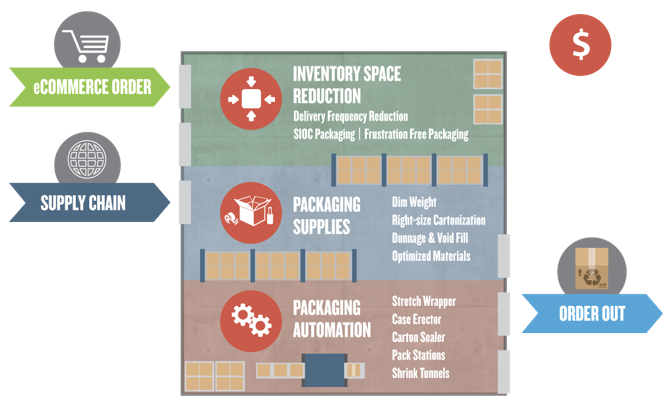 Here are the next steps for how to implement a comprehensive packaging strategy for solutions that are integrated and holistic. eCommerce home delivery, whether that be traditional or temperature controlled packaging, starts with the customer experience. As the design of the packaging is developed, it’s important to defer to customer preferences for a more rewarding eCommerce, ship-to-home unpacking experience. This includes reducing packaging waste, implementing a frustration-free packaging design, improving sustainability of packaging materials, and providing an overall positive brand experience through packaging print messaging. Minimizing packaging waste, upgrading the packaging design and components, and moving to sustainable products are important but so is cost. Implement cost saving methods by right sizing protective packaging to reduce DIM weight and box size. Thinner fluting can be less expensive to ship and can enhance graphics and print for a more positive brand impression. Finding the right balance of chill chain optimization through the utilization of thinner and lighter insulators that also extend shelf life and deliver fresher food will also improve the customer experience while minimizing costs. In addition, designing inner packaging to thoughtfully consolidate and protect key items (frozen, chilled, tropical, ambient) as well as managing temperature by zone will have a large impact on overall packaging and fulfillment costs. Efficiency in the fulfillment process can be achieved through the marriage of a positive customer experience and material cost reduction measures. As such, it’s important to conduct time studies to reduce labor needs, consider packaging and material design that allows for automated setup, implement conveyors and form fill and seal machines, and integrate the box with the insulation design for one-step assembly. This holistic approach to cold chain packaging will help to ensure the optimization of your chill chain requiring less storage space, reduced inbound freight costs, reduced outbound freight costs (linehaul and last mile) and fewer pallets shipped – which means fewer movements with forks and fewer trucks to load and offload. Finding a supplier that understands these unique needs of your chill chain is key to the overall success of your business. All of these nuances related to cold chain packaging and grocery delivery require a certain level of expertise to determine the best packaging fit. Therefore it’s important to select a packaging supplier that has specific experience with cold chain packaging. Through our ISTA / TAPPI certified labs, we empirically test every shipping scenario for each type of product to determine the best and most economical thermal packaging products to support unique supply chill chains like grocery delivery.